CREW Upstate | CREW Network Members Honored: Congratulations Jayne McCall! CREW Network Members Honored: Congratulations Jayne McCall! 18 Sep CREW Network Members Honored: Congratulations Jayne McCall! 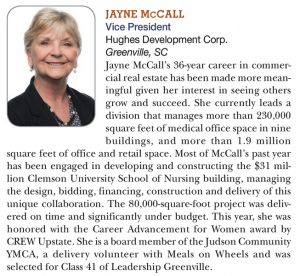 Please join us in congratulating 37 CREW Network members, including our very own, Jayne McCall with Hughes Development Corporation. All recipients have been honored by Real Estate Forum, being selected from nearly 500 nominees based on their achievements in, contributions to, and reputation in the business. Please take a moment to check out the special September edition of Real Estate Forum, which features a CREW Network cover story, a column by CREW Network President Tara Piurko, data points from CREW Network’s industry research, and a CREW Network Foundation story.